"Eventually," Dr. Herwald said, "we believe it will even be possible to automatically and continuously produce actual electronic equipment, such as radio receivers and amplifiers, starting from a pool of molten semiconductor materials." That was in early 1960 in an Electronics World article titled, "Molecular Electronics." The term "molecular" references what eventually became integrated circuits (IC), the first of which was realized in 1958 by Texas Instruments engineer Jack Kilby. Kilby's IC incorporated one transistor, one capacitor, and three resistors on a germanium substrate. Building on that success, researchers envisioned single-chip semiconductors which contained hundreds, thousands, and even millions of transistors, diodes, resistors, inductors, and capacitors. 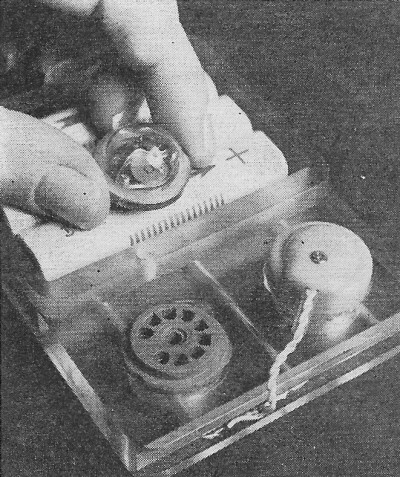 Miniaturization of, low power consumption than, and greater reliability than existing circuits types were the main goals at the time, but improved semiconductor materials and techniques soon enabled greater functionality and higher operational frequencies than standard vacuum tubes could handle. Mr. Kilby was able to witness that complete evolution and realization prior to his death in 2005. Tiny light-sensitive telemetry sub-system in which a single light-responsive element delivers an output signal whose frequency changes when the light shining on the element changes. Unit is plugged into tube socket at left, and is powered by the batteries shown. For demonstration purposes the output of the sub-system is connected to a small earphone. When employed in a telemetry system, the output might be used to modulate a subcarrier oscillator. This, in turn. is connected to a transmitter that radiates the telemetry signal to a distant receiver that detects the intelligence. New concept promises thousand-fold size reduction of circuits and added reliability with solid-state material acting as complete circuits without separate components. Circuits required for telemetry sub-systems. The Air Force and Westinghouse Electric Corporation recently demonstrated how the startling new concept of molecular electronics may revolutionize the electronics industry and extend man's reach into space. A variety of sub-systems were demonstrated which were said to be vastly more reliable and as much as a thousand times smaller than even presently used transistorized equipment. New systems, employing these concepts, could be operational in missiles or satellites in three to four years to perform such functions as telemetering light intensity or radiation levels back to earth, and providing infrared detection and reconnaissance information, flight guidance, and communications. 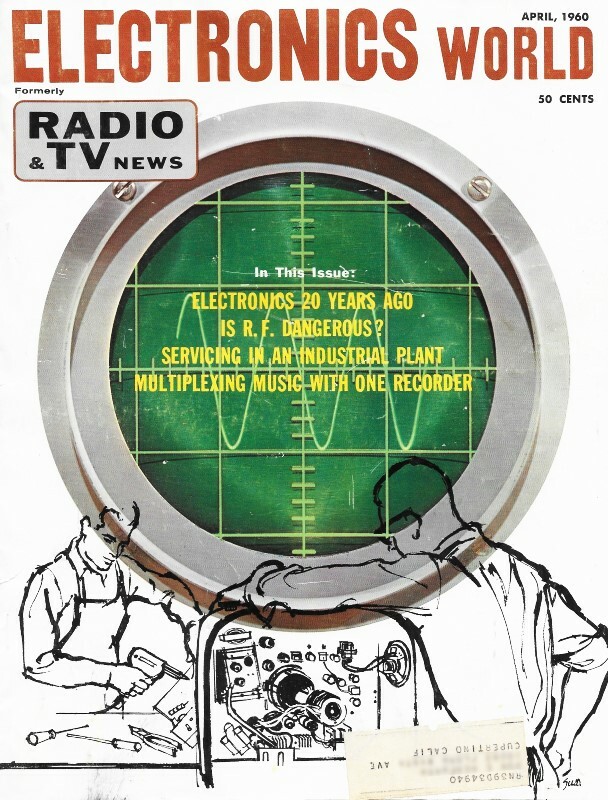 Present plans call for the development of a completely "molecularized" radio receiver for the Air Force in perhaps one year's time. 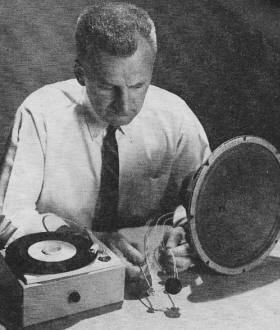 To show the feasibility of a molecular electronic amplifier sub-system, Dr. S. W. Herwald, Westinghouse vice-president in charge of research, demonstrated an audio amplifier used in a phonograph in which the preamplifier was the size of a match head and the 5-watt power amplifier, contained within a heat sink, was smaller than a dime. This new technique uses a different concept than is employed in micro-miniaturization. In the latter case, the designer usually starts with a conventional circuit and then tries to make all the components used in that circuit just as small and as compact as possible. In the case of molecular electronics, the attempt is made to design all the requirements right into the material itself. For example, assume that an amplifier stage is needed. The scientists fabricate a bit of material to which four leads may be attached; two of these apply the signal to be amplified to the material, and the other two take out the amplified version of the signal. The complete amplifying function is performed by a single piece of semiconductor material such as silicon or germanium. By such techniques as plating, etching, and alloying, the structure of the tiny solid piece is arranged to perform the same functions that now require many individual components which have to be soldered together. Molecular electronic phono system. Preamp is tiny unit in engineer's right hand, and 5-watt 0-20,000 cps power amplifier to drive speaker is in small black box in left hand. Three molecular electronic sub-systems. Device with concentric arcs is audio amplifier, at center is free-running multivibrator, and at the right is a two-stage video amplifier. The Air Research and Development Command awarded the company a $2-million contract last spring that made possible the rapid development of the sub-systems demonstrated. These included an audio preamplifier, audio power amplifier, 40-watt d.c. amplifier, video amplifier, tuned amplifier, bi-stable and monostable multivibrators, and logic switches. The drastic reduction in size, weight, and power would allow space vehicles to perform a greater number and wider range of functions. 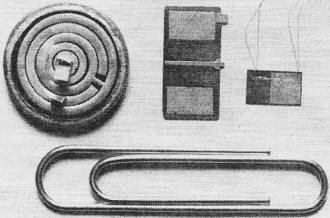 A new basic knowledge of semiconductor materials was required to produce the devices shown. This knowledge permitted a new technique to be used in growing semiconductor crystals. The new technique, a radical departure from existing methods, grows the crystals in the form of long, thin, near-perfect ribbons, or "dendritic strips." The dendrites can be incorporated into finished semiconductor devices without the need for intermediate material processing of any kind. "Eventually," Dr. Herwald said, "we believe it will even be possible to automatically and continuously produce actual electronic equipment, such as radio receivers and amplifiers, starting from a pool of molten semiconductor materials."